Brunston Castle is a 6,662-yard parkland course, designed by Tom Mackenzie (when with Donald Steel design) in the mid 1990s, located in the rolling South Carrick Hills in Ayrshire. 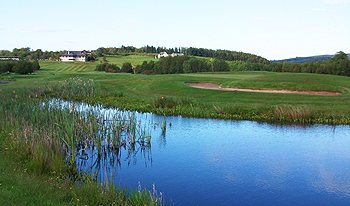 The Water of Girvan transects the layout, allowing water hazards to come into play on several holes. The river features on the tough, 404-yard, par four, 7th hole, named “The Big Roundel.” The narrow fairway runs alongside the water and anything left off the tee will end up in thick rough on the bank or, worse still, into the river. On the other side of the fairway, a large bunker at around the 220-yard mark awaits any tee shot that is pushed too far on that side. Add the fact that the contoured green is difficult to read and par four on the scorecard becomes a real prize. The back nine starts along the side of the valley until the highest point is reached at the 358-yard, par four, 14th, called “Curragh” where, on a clear day, the distant Ailsa Craig can be spotted out in the Firth of Clyde, over fifteen miles away. This is one of the toughest driving holes on the course, requiring a good carry to the Old Coach Road over a dip and on to the level ground on the other side. “Bruxelles” is the name of the 386-yard, par four, closing hole where the fairway rises over twenty feet back up toward the clubhouse where a warm welcome is guaranteed as you relax in comfort after your round at Brunston Castle. First of all, it's worth confirming that this is indeed a place of great natural beauty.And the course uses those natural attributes very well.I played the course in mid-November and the autumnal colours were gorgeous.Not being the world's greatest golfer, I found the course to be a good test without being too punishing on the odd wayward drive. It's quite a hilly track and on this cold and windy day (although mercifully dry) the second nine were quite hard work.The course was in pretty good nick for the time of year with winter tees in play, although some of the greens had moss and rather bare patches. There had been quite a lot of rain so some of the lower lying parts were a bit soggy.The green fee at £15 was very good value. If in Ayrshire and fancy a change from sea-side golf then definitely give this a try. I noticed that Brunston Castle had featured in a recent Top 100 Scottish ranking chart in a golf magazine so I made a point of paying the course a visit to see just what had projected the course into the magazine’s inaugural Tartan Ton. One of the first courses that Tom Mackenzie designed when he worked with Donald Steel, Brunston Castle is a very lush parkland layout set out in a rather peaceful valley with holes 3-7 and 11-16 played out on the opposite side of the river from the clubhouse. Transition holes 8 and 10 are played from one bank of The Water of Girvan to the other so good use has been made of this natural hazard. Water also plays a part elsewhere in the form of small ponds on some of the other holes (like the 6th, 13th and 17th). Sensible use of the tee positions from the regular yellow markers means none of the par fours play in excess of 400 yards which is reflected in an overall yardage of 6022 yards. So much for the stats, what about the playing experience? I liked the elevated tee positions on the best stretch of holes at the highest point on the course between the 12th and 16th (with a very intimidating tee shot at the 14th) and both nines end in a satisfying position after climbs to the front of the clubhouse. The greens are a top quality composition of grasses – my only gripe being that they were all very flat and generally uninteresting, apart from the 2-tiered 9th. Strange though it may sound, the fairways were real stars of the show with fairway mowing lines made in smooth “wiggles” between tee and green, adding a very pleasing aesthetic quality. If parkland golf’s your bag then Brunston Castle might just be worth a wee excursion to south Ayrshire. Brunston Castle has several very good holes, especially those such as the 7th, 8th and 10th where the river is in play. The 17th is a lovely par 3 and both the 9th and similar 18th make their way uphill to the clubhouse.